St. George church is located in the village Kurbinovo, on the slopes of the Mount Pelister near the blue waters of Lake Prespa. 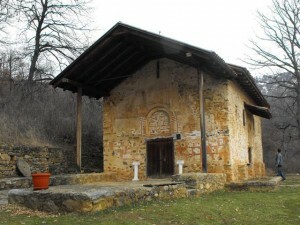 The small and charming single-nave church of St. George, dates from 1191. The fresco-painting is from the period of its foundation and represents a true masterpiece of Byzantine painting from the 12th century. 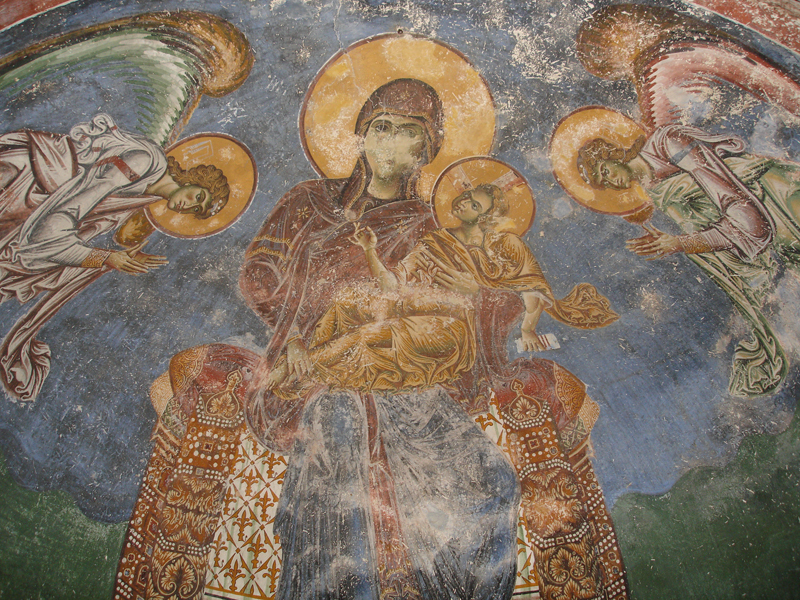 The donor composition on the façade – with the imperial pair, Isaac II Angel and Margaret, accompanied by the Ohrid Archbishop John Kamatir and the anonymous donor – complements the idea of the merit and importance of the painting in the Church of St. George in Kurbinovo (1191). The interior of this small and on the outside homely church contains some of the most valuable murals in Eastern Christian art. Their thematic-iconographic and stylistic features legitimise the authors, presumed to have been two, as being highly theologically educated and as having superior talent. For the first time in Slavonic-Byzantine art, the Liturgy of the Holy Archpriests takes place before the Lamb, which is a permanent reminiscence of Christ’s sacrifice. This is the first known representation of the Lamb of God (Agnus Dei) and it standardised the iconography of the bottommost zone in Byzantine churches. Eight holy fathers take part in the Liturgy, including St. Achilleus of Larissa, the patron of Tsar Samuel’s Patriarchal Church. Shown frontally on the lateral walls, St. Cyril, St. Methodius and St. Clement of Ohrid observe the Liturgy. This is the earliest surviving portrait of St. Methodius in Byzantine art and the first depiction of the two brothers and pan-Slavonic enlighteners together. Painted beside the portrait of his namesake Roman pope, St. Clement of Ohrid’s portrait is the only one known from the 12th century and provides continuity to his centuries-long portrayal in the Balkans. The naos has been painted in three zones. In the first zone are the standing figures of the saints. Among them, the frescoes showing Christ and the patron St. George, located by the altar screen, are remarkable for their monumentality, decorativeness and magnificence, while the depiction of Anne suckling her daughter Maria, placed by her husband, old Joachim, is remarkable for its rareness. The themes of motherhood, including representations of nursing women are very rare in Byzantine art. Hence, this mural showing a nursing mother becomes all the more significant. The second zone of the naos contains the scenes from the cycles illustrating the Great Feasts and the Passion. The scene of the visitation of the Mother of God to Elizabeth has also been included. Among the iconographie patterns of the scenes, that of the Dormition is particularly remarkable. Although it may seem conventional at first glance, the depiction includes a Mandorla in which there is billowy “live” water with realistic and monstrous animals and fish; among other things, there is a lion with a face of an old man and a snake tail. Here Christ’s ascension above the water – the source of life – also symbolises his function of the Heavenly Judge, as it was said in the Acts of the Apostles. The fundamental feature of the Kurbinovo master-painter’s composite style is that he achieved expressiveness through superior refinement. The drapery and the lines take the precedence in the expression. The figures’ internal world reflects in the unrestrained dance of the folds. The faces remain composed. The bodies assume celestial proportions. The crowd melts. The figures are elongated and strikingly slim. The obvious ideal to achieve disembodiment and a balance between ultimate elegance and ultimate expressiveness has been achieved immaculately. The church has preserved few but precious traces of its later life. The fragments illustrating parts of its patron’s biography, painted in the 14th century, are discernible on the south façade, around what used to be an entrance. The only principal icon in Kurbinovo showing Christ Pantocrator with golden background and a stucco ornamented nimbus, was created in Ohrid in the second half of the 16th century. Undoubtedly, this shrine’s fame and the reverence it enjoyed in the region have contributed to its continuous life. The circumstances of the Turkish rule reduced but never extinguished its activity. Serafimova A.,St George in Kurbinovo, Christian monuments, Cultural heritage protection office, Skopje 2009, 186-189. We run short, weekend and longer Byzantine tours that enable visitors to relax and enjoy wonderful scenery, sites and monuments. These tours are guided by professional archaeologists, art historians and historians with the qualified tourist licence given by the Ministry of culture of the Republic of Macedonia. We also provide first class information, for anyone with an interest in archaeology, history ethnology, art history, architecture and art – enthusiasts, students and researchers.